A pollution saving ethanol plant opened last month in Mead Nebraska that is setting a new standard for the industry. Environmentally friendly because of its cutting-edge technology, the high-efficiency ethanol distillation system at the Genesis Plant gets its energy from biogas derived from cattle manure and cellulosic biomass. The plant is built next to a feedlot with 28,000 beef cattle. The new plant uses a patented closed-loop system that uses virtually no fossil fuel, the leftover grain is fed wet to the cattle at the nearby feedlot, whose manure in turn powers the plant and creates high-quality fertilizer as a byproduct. 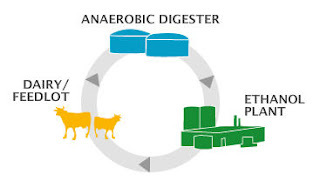 According to the company, the plant "offers a powerful method for waste management that protects the environment from the potential of manure runoff–a significant challenge for livestock farmers–and avoiding the emissions of methane, a potent greenhouse gas. " According to company CEO Dennis Langley, "The E3 BioFuels system lets America get its automotive fuel from the croplands of the Midwest instead of the oilfields of the Mideast. By successfully demonstrating this technology, the Genesis Plant has made a major contribution to U.S. energy independence and farm waste management, and offers a solution to global warming, as well."